Music festival season kicks off this month, and it all starts with the twentieth anniversary of the Coachella Valley Music and Arts Festival. 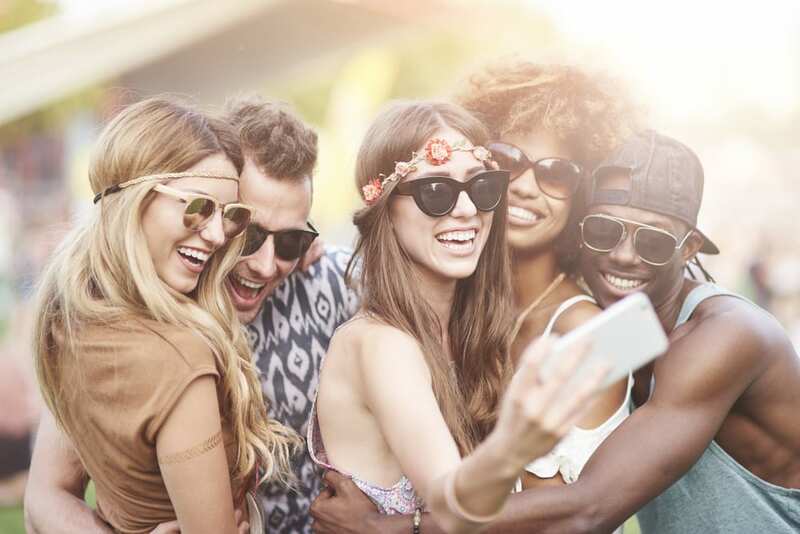 Coachella is one of the most popular music festivals in the United States, where celebrities and average joes come together to dance their hearts out in the outskirts of the Palm Desert. The festival is so big that artists like Frank Ocean, Childish Gambino and Lana Del Rey even pay homage to it in their song lyrics. If you haven’t experienced it yet, it’s worth taking an expedition to Indio at least once in your life. 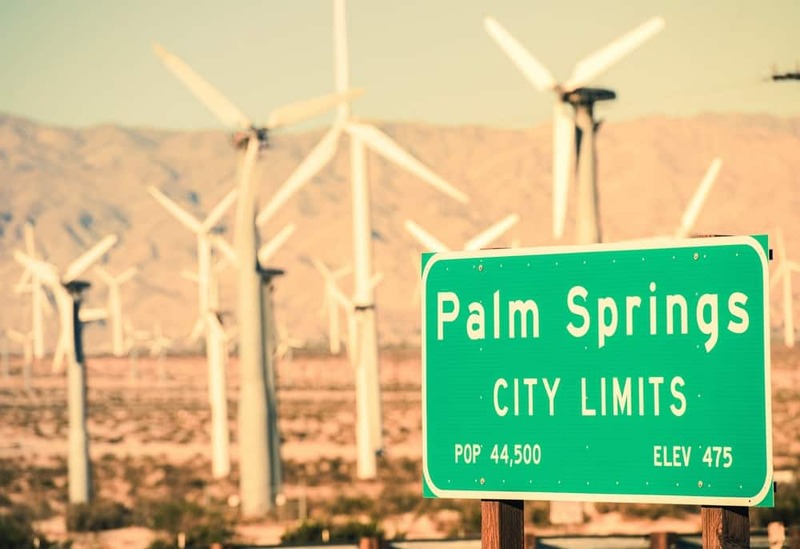 For our spontaneous friends out there who are considering booking a last-minute trip to Coachella Valley this month: allow VacationRenter‘s resident seven-time attendee to answer all your burning questions. First thing’s first – to tent or not to tent? The Coachella camping lifestyle has its advantages, including the ability to walk back to your home for the weekend at any point in time, making your own personalized cocktails at the campsite, and befriending all the incredibly fun people around you. But let’s be real, getting a vacation rental has major perks too. 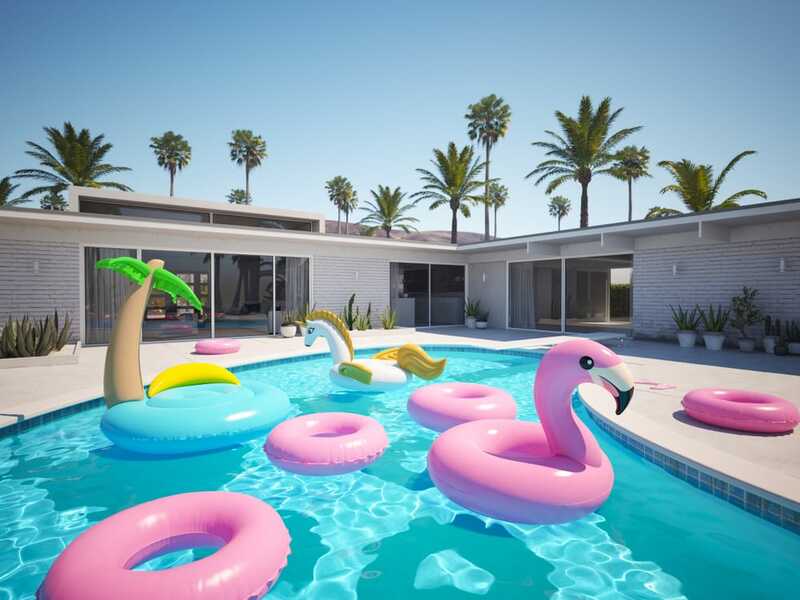 Spending mornings by the pool to cool off in 100 degree weather, taking a long relaxing shower at the end of the day, and coming home to a cozy bedroom with the air-conditioner on full blast, are just some of the many luxuries that come with booking a rental for Coachella. If you’re not too keen on the idea of roughing it out for three days in the Southern Californian heat, we can guarantee that having a vacation home for the weekend would be a better option for you. If you ask us, renting a house with a pool can elevate the entire Coachella experience. Realistically, how often do you get to have your own private pool party pregame before going to a music festival? It’s kind of a game-changer. Especially if you’re in your twenties or thirties, then you deserve to treat yourself with that hard earned paycheck! How would I get to the festival from a vacation rental, and where’s the best place to stay? There are a variety of ways to get to the Empire Polo Club where the festival is held, but the most important thing is that you don’t drink and drive. For anyone planning on having a carefree weekend, we highly advise getting a shuttle pass. Coachella’s official shuttle service provides over 20 different stops within a 25 mile radius of the venue, and it would be pretty convenient to find a place that’s just a short walk away from one of those stops. To start, you can check out a handful of cities near Indio to find the best vacation rental for you. Look up any availabilities in La Quinta, house rentals in Indian Wells, poolside homes in Palm Desert or resorts in Palm Springs. Keep in mind that those cities are listed in order from nearest to farthest from the festival grounds. Then, you can look on the map to see which shuttle stop is closest to your rental. Another option would be to take an Uber or taxi to the venue. Their pick-up and drop off lots are extremely efficient, and it saves you some time because parking has become a little hectic over the last couple years. Not to worry – there’s never a shortage of drivers in the area because they all know that Indio is the place to be if they want to bring in big bucks in April. Now, onto the packing essentials. What should I bring? As you pack your bags for a legendary experience, take note of the elements of nature that you’ll be working with all weekend. Earth & Wind – The festival is located so close to the desert, that sandstorms are not uncommon. Every now and then, a gust of wind may pass you by and earthly particles will go flying everywhere. Brace yourself and come prepared with a mask to cover your face! Some people opt for scarves or bandanas to match their outfits, and you can use anything you’d like, but don’t say I didn’t warn you. Fire – In this case, you’ll be dealing with a big ball of fire known as the beaming hot sun all day long. Even when you’re under a shaded tent, having a handheld fan will change your life. Score one of these battery operated ones that you can wear around your neck, or settle for a classic foldable fan that you can share with the people around you. Even random strangers in the crowd will thank you for sending a cool breeze their way. Water – Because the sun can be unforgiving at times, you can’t forget to hydrate as much as possible. Thankfully, you’re allowed to bring a reusable plastic bottle, and there are free hydration stations throughout the festival grounds. Camelbaks are also welcome, as long as they are empty when entering the venue. Take advantage of this eco-friendly option because it will also save you from constantly spending on single-use water bottles! 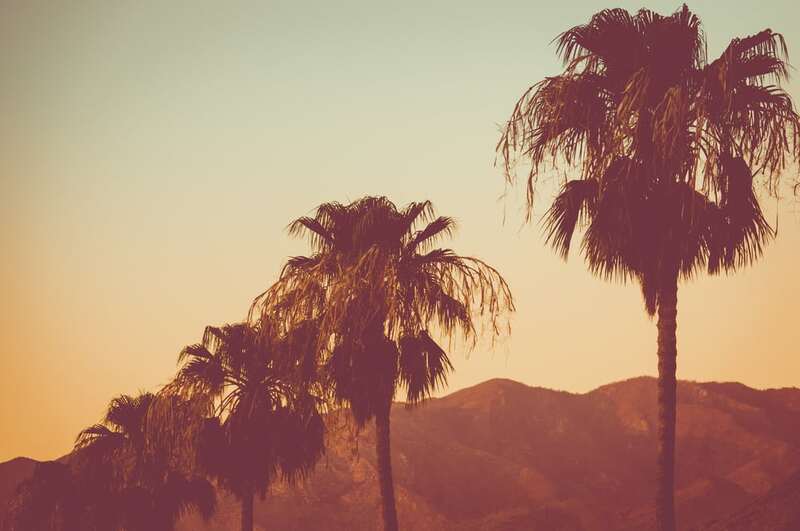 Any more words of advice for a Coachella first-timer? Do not rely on your cell phone service once you get through security. There are going to be at least 150,000 other people taking up the airwaves, so there’s a high chance that your group texts won’t go through immediately. With that being said, it’s essential to make meeting spots with your friends throughout the day in case you lose each other. The most important meeting time should be at the end of each day, so that no one goes home alone, or gets left behind. Before you all disperse to see your favorite acts at the beginning of the day, you and your crew should come to a consensus on where to meet after the last performance. You can use landmarks such as the ferris wheel, the lockers, or anything that’s relatively close to the exit. When that time comes, you can all wait at that designated spot until you’re finally complete. Plus, if you’re the kind of person who wants to see as many acts as possible, it would be a good idea take screenshots of the set times for each day, and make it your phone’s wallpaper every morning. You can even circle the acts that you definitely don’t want to miss. This way, it’s easily accessible and you can even see it in the dark. No need to rely on the Coachella App, or to scroll through all your photos to find that particular screenshot of set times. Lastly, be kind to everyone around you, and enjoy the festival. Cheers!